Synonyms: Elsholtzia ocimoides, Geniosporum prostratum, Thymus indicus Burm.f. 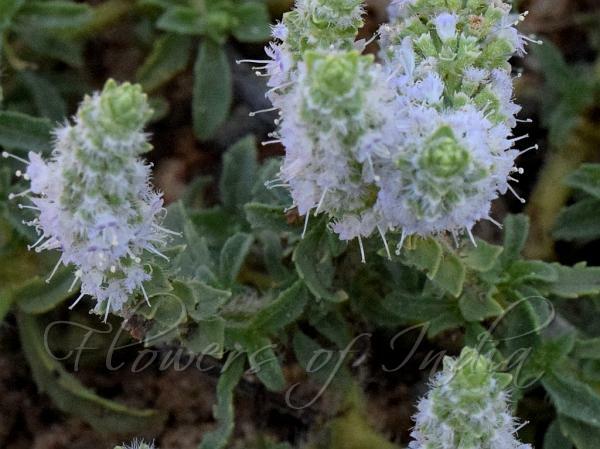 South Indian Thyme is a prostrate aromatic herb with many slender stems, 1-1.5 ft long, arising from a woody rootstock. Leaves are arranged in distant pairs, stalkless, or stalked, rather thick, very variable, obovate-lanceshaped or oblong or linear, base narrowed, sparingly toothed. They vary in size from 6 x 8 mm to 5 x 2 cm. Flowers are borne in slender, elongated spikes, in close or distant whorls. Bracts are ovate, pointed, curled back. Flowers are blue-purple, minute, stalked. Calyx is hairy, upper lip very variable in size, throat hairy. Flowers are 1-2 mm, hairy, with stamens protruding out. Fruiting calyx is 2 mm, almost bell-shaped, ribbed, tube not pitted, velvet-hairy. Nutlets are extremely minute, ellipsoid, smooth, naked. 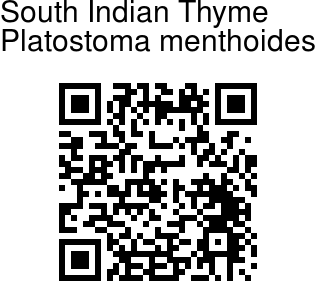 South Indian Thyme is found in Peninsular India and Sri Lanka. Flowering: August-December. Medicinal uses: South Indian Thyme has been used traditionally in South India for common cold and as a febrifuge for children. In Sriharikota Island in Andhra Pradesh, leaf decoction is taken orally to get relief from fevers.